Day 1 of the 2012 Farmers Classic ATP 250 has been completed. The final round of qualifying finished up. Bradley Klahn of the USA, Chris Guccione of Australia, Nicolas Meister of the USA, and Ricardas Berankis of Lithuania all edged their opponents in the final rounds of qualifying. They will now face their main draw opponents, for some a new experience in LA. The main draw matches held a few surprising upsets, specifically Flavio Cipolla’s win over American Jack Sock in straight sets. I was a bit taken back by Socks’ loss tonight, after his deep run in Atlanta where the youngster reached the quarterfinals, his first of a tour level event. The Italian, the higher ranked player (93 vs. 263), never let the American in the match. Cipolla knocked out Sock 3 and 1. Another surprising looser was Brian Baker. The American who has had a somewhat of a Cinderella story in 2012. Baker, who had been sidelined with injuries, came out of nowhere to reach the finals of Nice – an ATP 250 clay event – where he lost to Spain’s Nicolas Almagro. Baker, soon after, had a decent run at 2012 Wimbledon, reaching the fourth round at the All England Club. 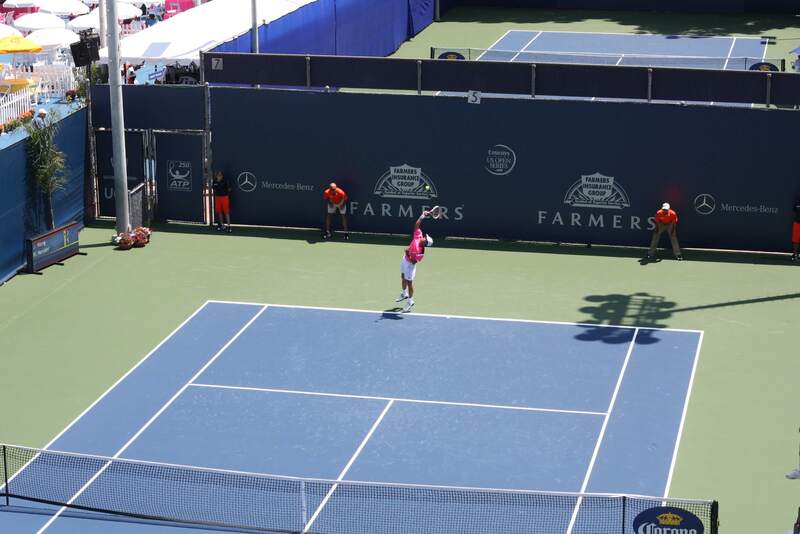 Though, in LA, he didn’t have the same fortune, fellow American Rajeev Ram took out Baker’s chances of having success on the tour this time around. Rajeev Ram – 7-6(3), 7-5. The final surprise upset came from from the doubles matches. 2012 Wimbledon Doubles Champion, Jonathan Marray partnered with Colin Ebelthite; the two found themselves on the receiving end of a very powerful German duo, Bjorn Phau and Tobias Kamke. The four played two uneven sets, though took the third to a hard fought battle, though the Germans prevailed. Taking the match 11-9 in the third.